This 2005 red Bordeaux from Rousseau de Sipian, purchased at Cambridge Wine Merchants (£12.99 for a single bottle, but case offers take it well below a tenner), was, I thought, the best of the wines from a recent tasting I arranged for some colleagues and although it was well-liked at the time, the appreciation seemed more polite than enthusiastic. To be fair to both the wine and my colleagues, it was one of a number of wines we sampled and probably did not show at its best due to a) following very crowd-pleasing and easy-drinking southern French Carignan b) not being allowed sufficient time to breathe c) being served without food. So, I decided to get another bottle, give it a couple of hours in the decanter and see how it showed on its own with a simple roast dinner. 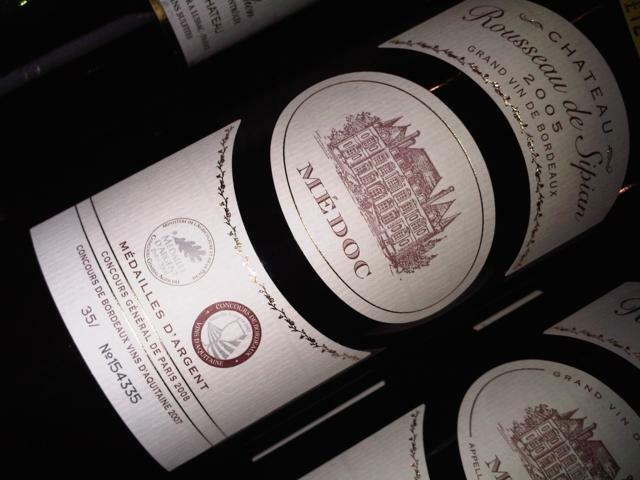 The Médoc is an area on the left bank of the Gironde in Bordeaux where Cabernet Sauvignon dominates. Cab tends to produce darker, chewier, more full-bodied wines than the Merlots which dominate on the other side of the river, but as this is a blend of the two in roughly equal proportions, there is the fullness of the Cab with the perfume and fruit of the Merlot. 2005 was one of the great years of the decade for Bordeaux, and this wine retails for a few quid more than its 2004 equivalent. However, I decided that, although this took the price well of "everyday wine" territory, it was worth the extra money for the year and the two medals it has garnered - a silver from the Concours General de Paris 2008 and a silver from the Concours de Bordeaux Vins d'Aquitaine 2007. First off, this is still quite young, even at 5 years, and needs a bit of time in the decanter before it really opens up. Deep red, almost inky in the glass, it has a rich nose with a blast of blackcurrant fruit with vanilla, cedar and hints of earthiness and spice. The palate is full and soft with dark berry fruit, liquorice and pencil shavings but what impresses the most is the texture - rich, dense and mouthfilling, it really is quite special - something I am learning to associate with good Bordeaux and which tends to make otherwise very good wines seem thin and two-dimensional by comparison. There is a good finish with some acidity and a firm tannic grip that benefits from some food. According to CWM's website, this wine was recently selected by Tim Atkin MW in his Guardian supplement as one of only 3 Bordeaux wines in his choice of the 36 best value wines currently on offer from France and describes it as "an attractively drinkable claret". Bordeaux is generally something of an old-school wine - it is not showy or flashy, but has subtlety, restraint and balance and it not only tends to need food, but somewhat old-school food, such as plain roast meats. Our accompanying meal therefore had distinctly old-school overtones, too - but it was by no means plain or boring; a leg of rare-breed lamb from a smallholding in Willingham seasoned with salt, pepper, chopped rosemary and crushed garlic, then slow roasted and served with potatoes, carrots and celery all roasted in the same pan as the meat. We followed this with roasted nectarines served with clotted cream ice-cream and a glass of Lustau East India Oloroso (see here). £12.99 for a single from Cambridge Wine Merchants, discounted to £9.52 per bottle for a case of 12.